Charles Morris Christensen’s daring ride. 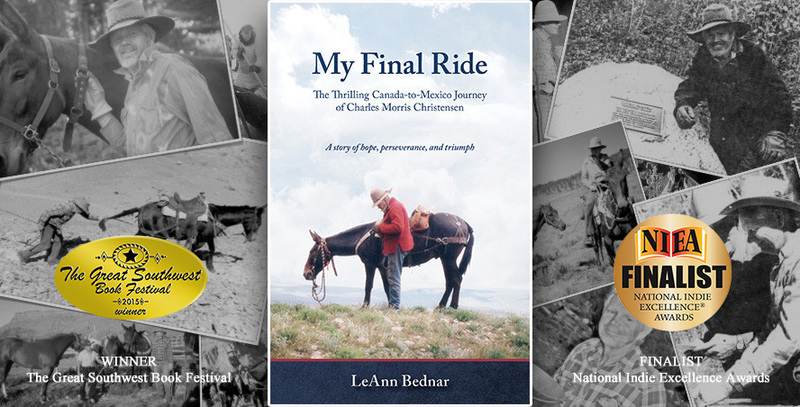 My Final Ride is the true-life story of Chuck Christensen’s epic mule-back Canada-to-Mexico journey while battling stage-three bone marrow cancer/multiple myeloma. Given eighteen months to three years to live and told he’ll never ride again, Chuck crawls back on his mule and, with tears streaming down his face, vows to trek as far as he can. Learning of the Great Western Trail, which eventually is to stretch from Canada to Mexico, he excitedly sends letters, makes phone calls, collects maps, and sets out on his daring ride. Along the way he faces mud bogs, giardia, broken bones, and deep discouragement; more than once he worries he’ll have to put an animal down. With water and food scarce, his mules begin to eat cowpies; his horse, however, refuses, and begins to starve. Ultimately, Chuck’s success depends on his fixed determination to never give up. A story of hope, perseverance, and triumph. LeAnnBednar.com © 2019 . All Rights Reserved.